Benefit from RedSeal’s experienced government partners. 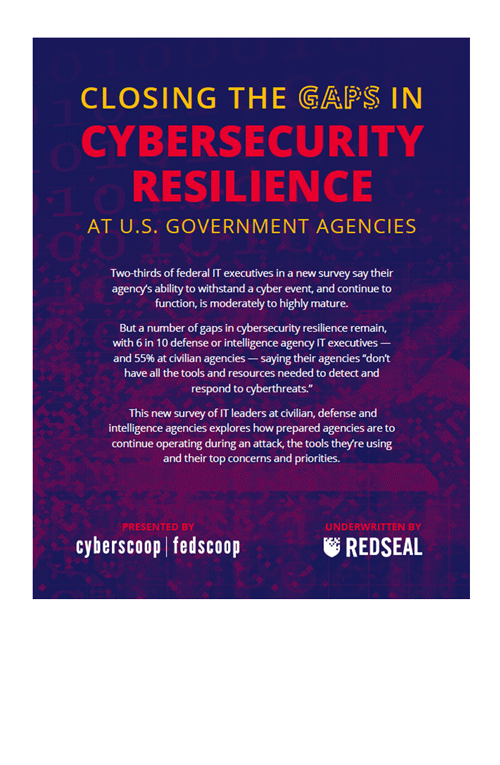 RedSeal’s network of experienced government partners works with government organizations to improve the resilience of critical, complex networks, accelerate investigation, and ensure that security investments are working as intended. immixGroupimmixGroup enables technology manufacturers and IT solution providers to grow their public sector business, while offering government agencies reliable access to the enterprise software and hardware solutions they need to achieve mission success. FCN TechnologiesFCN provides networking services, storage solutions, enterprise application development, personnel services, consultation services, and products vital to the operations of the Federal Government. MAD SecurityMAD Security, the premier provider of cyber security solutions that combine technology, services, support, and training. Assurance DataAssurance Data is a security focused IT consulting firm offering a wide range of solutions and services that enable our customers to mitigate risk, secure data and optimize performance. Blackwood AssociatesBAI is a Woman Owned Small Business based out of Annapolis, MD that has focused on providing innovative IT solutions since 1977. Braxton-GrantBraxton-Grant Technologies, Inc. (BGTech) is an Economically Disadvantaged, Woman-Owned Small Business (EDWOSB) specializing in cybersecurity services and product sales. BRTRCThe SecureForce Information Assurance Team works diligently assisting organizations to minimize risk through the development and management of security protection programs that safeguard the integrity, confidentiality, and availability of critical systems and data. CompSecHelping our government customers by providing technical, contracting, and logistical expertise in support of their mission. Computer Marketing AssociatesCMA is a value-added reseller and systems integrator of Information Technology (IT) integrated solutions to Federal, State, and Local Governments and a leading provider of financing and business development services to industry. CTG FederalCTG Federal is a small business that provides IT solutions to the US Federal Government. We bring extensive experience and professionalism whether you need VDI, cloud services, data storage, or hyperconverged infrastructure. Epoch ConceptsEpoch specializes in storage systems, disk based backup systems, network optimization, virtualization, and thin client technology. Flywheel DataFlywheel Data provides elite solution design, system integration, software development, and product resale for data-driven-organizations. FragCity, Inc.FragCity, Inc. provides extensive experience servicing our Armed Forces and Federal Agencies. GovplaceGovplace is a value-added reseller and systems integrator, exclusively focused on providing the public sector with best of breed products, services and solutions. iGoviGov is a Federal Systems Integrator and Value Added Reseller with headquarters in Reston, VA and operational facilities in Tampa Florida where we perform R&D, systems and software engineering, integration, logistics and sustainment for our customers. Iron Bow Iron Bow Technologies is a leading IT solution provider dedicated to successfully transforming technology investments into business capabilities for government, commercial and healthcare clients. International Systems Marketing, Inc.ISM is a group of IT security-minded professionals dedicated to helping our customers optimize their security architecture to achieve dynamic and proactive cybersecurity through in-depth business and product knowledge, high quality service deliverables and reliable customer service. Point Rock SolutionsOur mission is to be the trusted partner for our clients in IT communication solutions by identifying and providing the right hardware, software, service, and support that meets their needs. QCMQCM Technologies, Inc. is an established Business IT Solutions Reseller offering superior fluency architecting a host of solutions and services to our valued group of select customers. Sealing Tech We are a Veteran Owned Small Business (VOSB) that provides cutting edge research, development, and implementation services in the areas of cybersecurity including Engineering & Architecture, Test & Evaluation, Piloting & Prototyping, Integration & Logistics, Training & Exercises, and Operations. StorageHawkStorageHawk, specializes in technology sales and consulting to all verticals of the Federal Government, including the Department of Defense, the intelligence community, and civilian agencies, as well as Fortune 500 companies. Swish DataSwish is a customer-centric, specialized integrator with an engineering first culture. We are structured as a Service-Disabled Veteran-Owned Small Business (SDVOSB). Thundercat TechnologyThunderCat brings an innovative approach to solving customer problems in and around the datacenter by providing strategies for Data Storage, Applications, Networking, Security and Analytics. World Wide TechnologiesWorld Wide Technology (WWT) is a technology solution provider with more than $10 billion in annual revenue that provides innovative technology and supply chain solutions to large public and private organizations around the globe. Join RedSeal’s team of government partners. The RedSeal Government Partner Program is made up of the industry’s elite cybersecurity companies, designed to drive new business opportunities, deliver top solutions to our government customers, and increase our partners’ profitability. Interested in becoming a RedSeal Government Partner? Contact us here.